People do not often associate the work of a forensic archaeologist with that of an art historian. A forensic archaeologist solely studies crime scenes and physical remains, right? As illustrated by Professor Beisaw’s lecture, forensic archaeologists can use photographs and paintings of crime scenes to solve murders that occurred years prior. By analyzing a photograph of a crime scene as an art historian may study a classical antiquity, a forensic archaeologist can actually learn a significant amount about the events that led up to the murder of a victim. 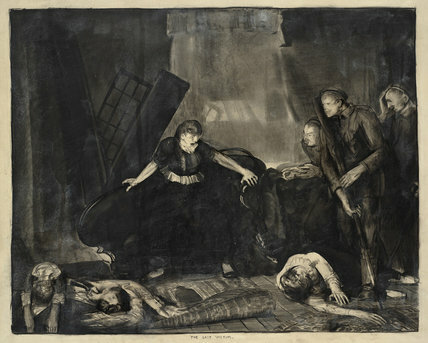 In “The Last Victim,” George Bellows illustrates an event that he did not actually witness. However, he depicts a moment of intense human struggle precisely. Without actually being at the crime of the scene, a forensic archaeologist can tell that the slightly upturned rug indicates that the victims struggled to flea from the perpetrator. The anguished faces of those still alive suggest that the attack was unexpected. In a second work of art, an unnamed police homicide photograph taken in New Jersey by an anonymous artist , a man lays dead on the ground, a pool of blood forming under a nearby desk chair. Through the use of modern technology, an archaeologist can zoom in on different objects in the room of the crime scene. These artifacts not only help in determining the date of the homicide, but also, provide clues to the victim’s identity. 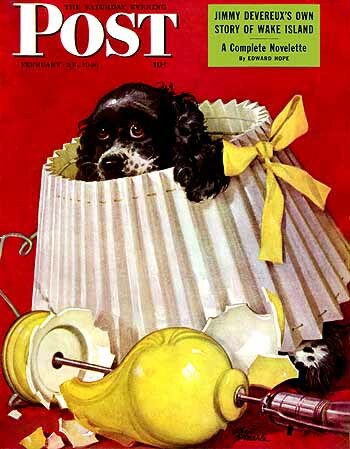 It has been determined that the photograph was captured shortly after World War II because of several artifacts found in the room, including copies of the Saturday Evening Post from February and March 1946. Example of Saturday Evening Post that was enlarged to determine an estimated date of when the photo was taken. (Not actual issue in photograph). Due to the fact that the man’s face is obscured by a desk, a forensic archaeologist needs to employ other methods in order to determine an identity. Additional artifacts were enlarged just enough to recognize that that man in the picture had a long first name, but a short last name and that he “lettered” in a sport in high school. A piece of paper with a list of names on it likely contains the name of the victim in the photograph. Upon further investigation, this list may hold the key to identifying the victim. As demonstrated in Professor Beisaw’s lecture, art historians and forensic archaeologists both use art as a means of learning about the past. While the art is studied from very different angles, the works allow art historians and forensic archaeologists, alike, to solves mysteries of the past. This entry was posted in Fall 2013 and tagged Art, Forensic Archaeology by saaugenbraun. Bookmark the permalink.